All crew members onboard containership need to take all basic training as per STCW requirements prior to joining vessel. The Master shall give each new crew member familiarization training and instructions which must be understood to the crew member before commencement of duties onboard. The Master shall designate a qualified person in charge of training the new crew members. The content of the familiarization training is highlighted below. The person designated by the Master as trainer shall train the new crew member in the following areas using the ship’s Muster Lists, SOLAS Training Manual, Fire Safety Operational Booklet and other relevant documents and publications. Communication with other persons on board in Elementary Safety Matters and understanding of Safety Symbols and Signs and alarm signals. •	Identify Muster and Embarkation stations and Emergency escape routes. •	Locate and don Life-jackets and Immersion suits. •	How to raise the alarm and basic knowledge of the use of Portable Fire Extinguishers. •	Take immediate action upon encountering an accident or a Medical Emergency before seeking further medical assistance. •	Closing and opening of the Fire, Weather-tight and Water-tight doors fitted on the ship other than those for hull openings. •	Locate own cabin, nearest escape route and Fire extinguisher. Ships mooring station may expose new joining crew to potential dangers if not proerly familiarized. If at all possible, the new crew member shall be introduced to his duties by the crew-member he is relieving. If this is not possible, the trainer will carry out such introduction. •	The specific equipment the new crew member will be using or operating. The trainee shall instruct the new crew member how to use or operate specific equipment with particular attention to those mentioned in “List of Duties for Crew” . •	Engine department: Machinery which the new crew member will take in charge and other related Machinery in the engine room. •	Ship specific watch keeping duties. If new crew members engage in the ship specific watch keeping, the trainer shall instruct them to comply with Procedures for Watch keeping in Port , Procedures for Navigational Watch keeping and Procedures for Watch keeping in Engine Room and others mentioned in the ship specific “Standing Orders”. The trainer shall instruct the new crew member in the use of Safety and Protective equipment and to observe Safety measures at Workplace and handling of Fire onboard the ship in accordance with “Procedures for Management of Safety and Health Onboard”. The trainer shall instruct the new crew members how to handle Garbage and Waste generated on board the ship in accordance with “Procedures for Environmental Protection” . Also trainer shall also instruct the new crew member on the ship’s Garbage Management Plan and Ballast Water Management Plan. The trainer shall instruct the new crew members what actions must to be taken in an Emergency situation in accordance “Emergency Response” . The trainer shall instruct the new crew member as per requirements of the Ship Security Plan. 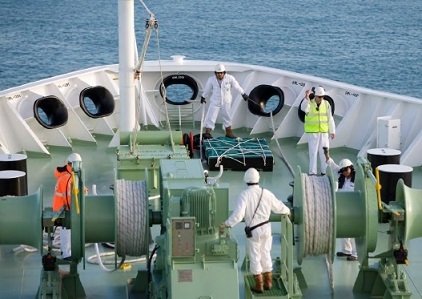 Onboard training in the use of ship’s life saving appliances including Survival Craft equipment and fire extinguishing appliances shall be completed as soon as possible but not later than 2 weeks after joining the ship. The trainer shall conduct tour of the vessel along with the new crew member for familiarization training purposes. Upon completion of the familiarization training, the trainer shall confirm each of the above with date together with the crew member’s signature in the “Onboard Familiarization Record” and submit it to the Master. The Master shall check and sign the record and keep it on board the ship while the crew member is on board.